This Micro Collection piece has generated a good deal of debate amongst some collectors. Is it an AT-AT Driver figure--a character that was never produced in the Micro line--or is it simply an alternate version of the TIE Pilot figure? As anyone familiar with the Micro line will immediately realize, the figure is, in almost every respect, identical to the common TIE Pilot. The only differences occur with respect to the mouth piece and breathing tubes of the helmet. Whereas the regular TIE Pilot has a mouthpiece extension onto which the two tubes are attached, the 4-up you see pictured here has no such mouthpiece and the tubes wrap around to the back of the helmet. So, what is it? Well, there's no doubt that the helmet structure is closer to that of the AT-AT Driver than it is to the TIE Pilot. But, for the most part, the helmets of the two characters so closely resemble each other that small differences can almost be excused. 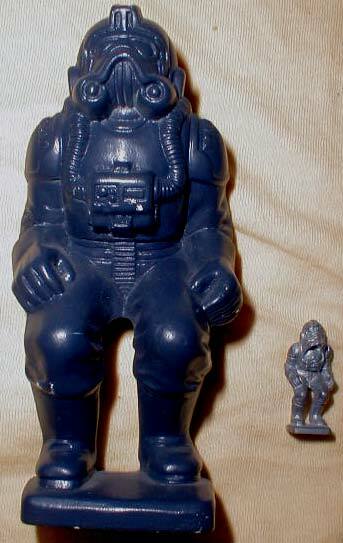 It's quite possible that Kenner simply goofed when sculpting the figure and then had to go back and modify it. Also, it's indisputable that, aside from the helmet details I've cited, the two figures are identical; the sculpting that was used for the earlier of the two figures (whichever one that is) was used to generate the later. Then there's the small detail that absolutely no AT-AT toy is known to have been in development for the Micro line. Could an AT-AT Driver figure have been considered for use with the AT-ST that was included in the Hoth Generator Attack playset? Maybe. But, personally, I think that's stretching the theory a bit. 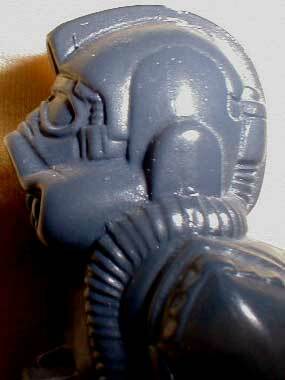 Lastly, I've seen paperwork indicating that Kenner ordered silicone molds and hardcopies to be made of two distinctly different TIE Pilot figures. In this paperwork, no mention is ever made of an AT-AT Driver figure; only version 1 and 2 of the TIE Pilot are referred to. Anyway, when all the evidence is considered, I think it's much more likely that this is just an early version of the TIE Pilot, which Kenner later had to modify in order to make it conform to the costume used in the films. Still, it's an interesting piece. And you're free to believe it's an AT-AT Driver if you really want to :^).